Can Butch Jones' team make enough progress in 2017 to satisfy Vols fans? We’re now more than halfway through The Comeback’s Top 50 countdown, pushing into the 20s! We’re moving up the list each day as part of our 2017 college football preview, leading up to the opening of the regular season. Up next, the Tennessee Volunteers. Butch Jones enters his fifth season in Knoxville and finds himself (and his team) in an interesting position. During his first three seasons, Jones showed continued, steady improvement. After the tire fire that was Lane Kiffin and the unsuccessful run of Derek Dooley, Jones was a very welcomed change. 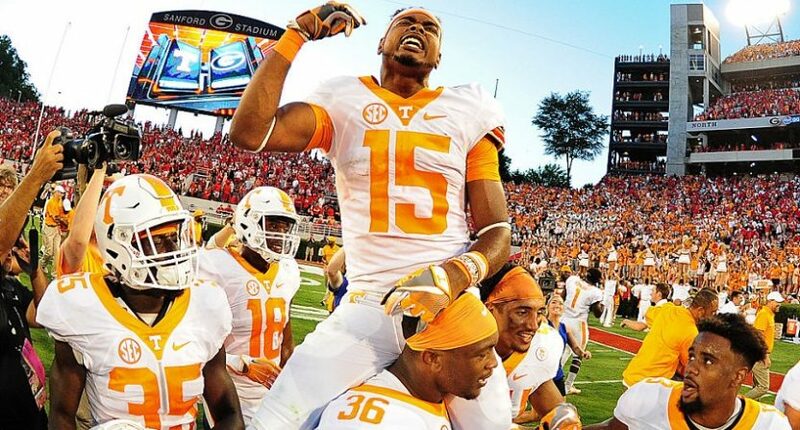 Last season, the Vols were a hot pick to take the SEC East. The Vols started strong but faded down the stretch, leaving questions about Jones and if he is the right man for this job. Now that Jones enters his fifth season, this is clearly his team with his players. After taking a small step backwards in 2016, all eyes are on Knoxville to see what progress is made during the 2017 season. Tennessee felt a little bit like a team of destiny after the first five games of the season. They came from behind in their season opener against Appalachian State and actually won the game in overtime when they fumbled the ball into the end zone and then recovered it. They were getting drilled by Florida 21-0 before a miraculous comeback in game four. In game five, Jacob Eason threw a dagger 47-yard touchdown to put Georgia ahead with just 10 seconds left. What did Tennessee do? They won the game with a Hail Mary straight out of a highlight film for the ages. We all questioned how good this Tennessee team was but at 5-0, all that mattered was that they were winning. Their luck ran out in game six with a loss to Texas A&M that started a three-game skid. The skid included a loss to lowly South Carolina. From there the Vols rebounded and went 3-1 to finish the season but lost to Vanderbilt (which didn’t sit well with Tennessee fans). After starting the season with such promise and beating their top two competitors in the division, Tennessee found a way to lose the division — mainly thanks to losses at South Carolina and at Vanderbilt. Tennessee brought in a good class of 28 that ranked them 17th nationally but only 7th in the SEC. This class features 1 5-star recruit and 4 3-star recruits. This is the lowest ranked class of the Jones era other than the year he took over. Offensive lineman Trey Smith was one of the top recruits in the country and should make an early impact. Another to keep an eye on is running back Ty Chandler, who will be looking to help fill the void left by the departure of Jalen Hurd and Alvin Kamara. 26 – The number of turnovers the Vols had in 2016. This was with a senior leader at quarterback and an experienced backfield. 5– The average yards per rush that the Vols defense gave up in 2016. In three of their losses. they gave up four rushing touchdowns in each game. 37– The number of plays over 30 yards that the Vols defense gave up in 2016. This was the second-worst in the SEC. Only Arkansas gave up more big plays than the Vols. Why it matters: Last year’s comeback win against Florida was the first win in the series for the Vols since 2004. Building a win streak against Florida would be a huge win for the Vols and would give them a ton of momentum. This game also falls early in the schedule and is against one of the Vols’ top competitors for the East crown. Butch Jones and Tennessee need this game. Why it matters: Butch Jones has flipped the momentum in this rivalry. Georgia had won five straight, but that all ended in 2015 and the Vols have now won two in a row. Keeping the Dawgs in check is big for Butch and the Vols’ chances to win the East. If the Vols falter against the Gators, they cannot lose this game. If they win both, then the division is theirs for the taking. Why it matters: Last year, Tennessee had everything lined up, but then lost to their alternating West division opponent (Texas A&M). Tennessee draws Alabama every year and this year they’ve drawn a very tough alternating opponent in LSU. The Vols can’t afford to drop two games again this season to West division foes. John Kelly, RB – The Vols will be breaking in a new quarterback and that means the running game will need to be on point. After barely playing in the first five games of 2016, Kelly came on strong and gave Vols fans a taste of what he can do. Expect him to get the rock early and often as he will be a vital part of the Tennessee attack. Darrin Kirkland Jr, LB – Injuries limited Kirkland last season. The Vols were 6-2 with him and just 3-2 without him. Kirkland is the anchor of the defense and he has to stay healthy for the Vols defense to improve in 2017. Having him in the middle each and every week will be key to improving a rushing defense that was among the worst in the league last season. Todd Kelly Jr, S – Despite missing a little time in 2016, Kelly led the Vols in total tackles. Kelly provides leadership on and off the field and is one of the senior leaders of this team. Kirkland is key in the middle of the defense but Kelly provides the needed stability in the back end. The combination of these two should help solidify the Vols defense, especially if they get some needed help from the defensive line. Tennessee will beat Florida for the second straight time. After a long drought, the Vols will start a winning streak against the Gators after they win a close one on the road. For the third straight season, the Vols will finish with a record of 9-4. The Vols have had some big turnover at key areas on offense and have a lot of questions on defense. They have a high ceiling, but the Vols will be unlikely to be much better overall than they were last season. Tennessee’s star will shine very bright at times in 2017, but there will also be some extreme low points. The big question is if the Knoxville natives will be happy enough with Butch Jones after three straight 9-4 seasons.